After the mixed Colombia special, it was time for The Grand Tour to resume to its usual format. This week’s show feature three pick ups, a Jaguar Project 8 and some decent banter on Conversation Street. It sounds good, but was it? Can Europeans make decent pickup trucks? That is the question the trio set to answer this week, and to do this, CHM set out to see if they would be any good in a developing country. We start the action in the middle ages, where James May was born. 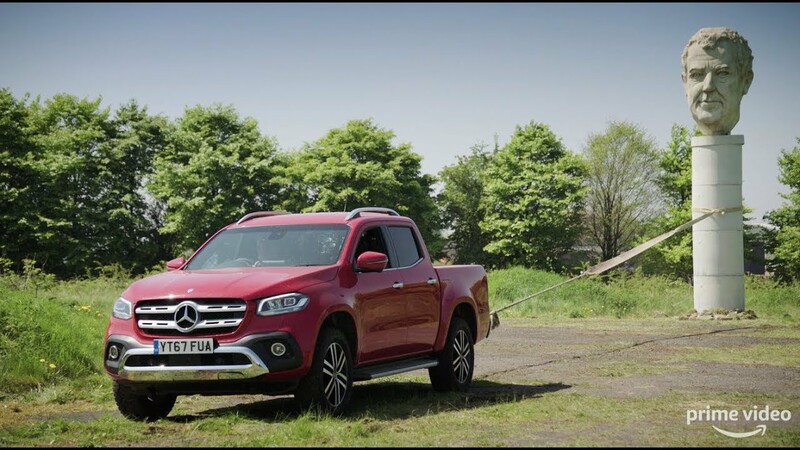 Speaking on the man himself, he has a Mercedes X Class which he was using to help cut some wood, whilst Richard Hammond was using his Ford Ranger as a plough. 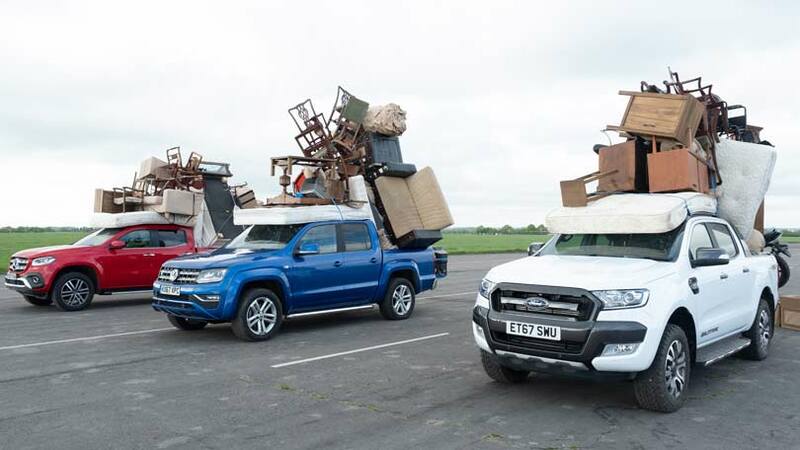 That leaves Jeremy Clarkson and his V6 powered Volkswagen Amarok, which is being used as a water pump – badly. This segment, with its tired gags and staged nature rather sets the tone for the film I’m afraid, as we see James May supposedly get hit by a cabbage following Clarkson’s hose going out of control. I’d like to think I perhaps being harsh, but it just felt too contrived. Despite Clarkson virtually destroying the village, he declares himself the winner in typical JC fashion and the trio move on to the next challenge, which involves toppling ‘dictator’ statues. The winner is the one who requires the least amount of revs. After pulling a comically small statue – that gag landed quite well for me as it happens – Jezza once again declared himself the winner. I was really counting on Conversation Street to help bring the show up to speed because up until this point, it had felt like a bit of a non starter. I’m delighted to say it didn’t disappoint, as there was a lot discussed including electric cars. This topic offered up good banter, and some good points as well, which was of particular interest to me as I recently tested the Nissan Leaf. Next up we see Jezza with a very angry looking Jaguar. It’s an XE, but not as you know it. No, it is in fact the Project 8, an XE that has been turned up to 11 by Jaguar’s peformance division. 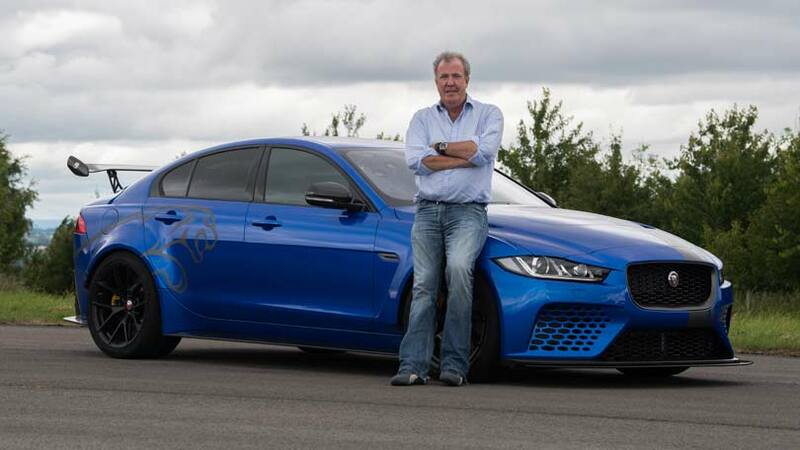 Clarkson talks through what has been changed, and within this piece you see the XE morph in to the Project 8 thanks to nifty editing. In fact, the whole piece was shot and edited beautifully, making it one of the best segments of this season if you ask me. Jezza then goes on to ask who would be mad enough to buy it, given that it costs around £150,000 – that is a lot of money for the car! At this point I thought the test was going to turn in to one of Clarkson’s silly ones, or that he was really going to lay in to the car. But no, like he did with the McLaren Senna, Clarkson delivered a fantastic piece about the supercharged Jaaaagg and the whole piece was entirely captivating and engaging. I was so engrossed in the action that I forgot to stop taking notes for this review. This is the sort of content I love seeing on The Grand Tour – cracking stuff. Remember that episode in Jordan all the way back in season 1? The one where a lot of things blow up and the segment served very little purpose at all? Well, that’s what the second part of the pick up film reminded me off. The trio resume the pick up video with each of their respective vehicles carrying fuel in the back. The name of the game is that they need to race to get it to the ‘nation’s helicopter’ I’ll be honest, there were some decent bits in this segment as well as some good gags, but the explosion at the end was simply needless and predictable. Not quite as predictable as the outcome of the shooting that occurred later on in the piece, which as so scripted, it actually felt a bit insulting to watch. Very well said. 4 series into the season 3 and I am already asking myself – is it worth to continue any longer?The trio is acting in such a purposeless and boring way, that it’s a even painfull to watch. You think, at least they should focus on cars – and then we get something as this Wales episode. Totally dissapointing. They are like dying breed of dinosaurs compared to how Doug DeMuro with his lo-fi way presents and digs into each detail of car – you get so much feeling about car itself – or compared to what Chris Harris is doing on TopGear’s YT channel so far – mixing serious and honest review with fun and wit humor. If after season 2 the hopes were quite high, for me personally, these 4 episodes are the lowest mark Grand Tour ever been.